Use the bounty of the Fall harvest for a Fall Idea Menu. This is a Fall-Winter menu planning guide. Click for others on the website to help you do just that. All the needed recipes are provided. And all the recipes are indeed tested (tasted) and approved by real restaurant customers. They are all real restaurant recipes. When planning a menu, like this Fall menu, we should take advantage of seasonal products that will be fresh and hopefully less expensive than at other times of the year. For appetizers you can keep things simple, but simply delicious, by serving fresh artisan breads with marinated mozzarella and pesto sauce. How about some delicious Fried Cheese with Marinara Sauce? 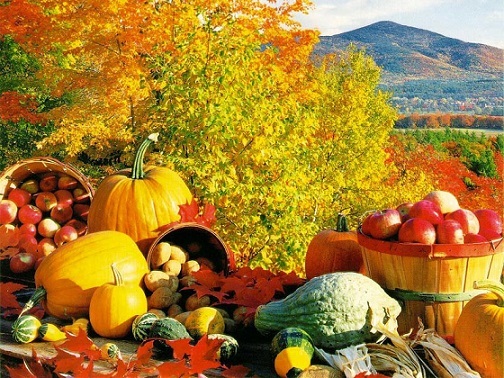 Soups can be made from squashes, cabbages and root vegetables this time of year. There are a number of choices on the website (soup recipes). One specific recommendation to consider is French Onion Soup. Serve this with small pieces of bread meant for dipping into the liquid. Simply spread the bread (or pita bread) with herb butter or with herbs and freshly grated Parmesan cheese and lightly toast them until crisp. You can easily make a batch ahead of time and store in an air tight container for the next time you make homemade soup. Salads, of course, can also abound with seasonal delights. 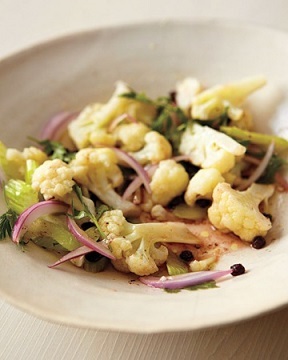 Fresh raw cauliflower can easily be turned into a wonderful cauliflower salad. And when you have company, how about serving a molded cranberry salad or make the same salad in individual portions. Often the main courses are heavier at this time of year, and many meats are wonderful. But try a beef pasta combination such as a wonderfully rich beef stroganoff. And the restaurant and home guests all like the recipe for Pepper Steak as well. Don't forget about comfort food! 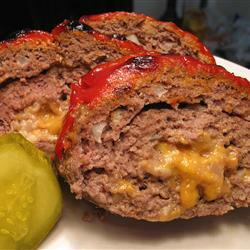 Try the Bacon-Cheese Stuffed Meatloaf! I really like a chicken and rice combination for a one skillet, one plate, fall idea menu. 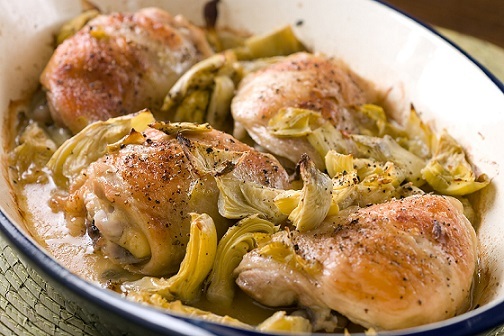 Or try something a little more involved like the recipe for Artichoke Chicken Sauté or Chicken with Brandy Cream Sauce! Serve either of those with sweet cooked carrots. This recipe asks you to cook the carrots in chicken stock. You'll definitely notice a wonderful difference. Pasta? Of course! Win your family and guests over by preparing Fettuccine with Chicken and Sun-Dried Tomatoes in a Pesto Sauce. Seafood? There are quite a few restaurant seafood recipes on the website to choose from but I'd like to draw your attention specifically to the Spicy Shrimp Scampi Sauté and Fish with Lemon Hazelnut Sauce recipes. Both meals are memorable and neither is difficult. Thinking about an inexpensive casserole you could prepare ahead? Try the restaurant recipe for Potato Cheddar Pie. You’ll love it. Or “wow” the family with an easy but wonderful Tamale Pie. Add some Mexican Hot Sauce and those you cook for will stand and applaud. Restaurant Dessert Recipe? 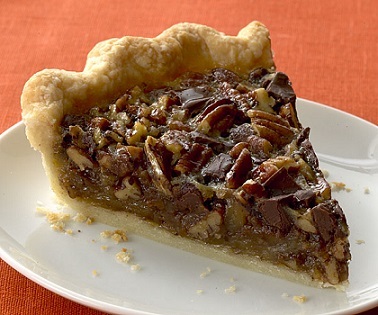 How about impressing everyone by making the favorite Nanaimo Bars or the absolutely delicious recipe for Bourbon Pecan Pie? Of course ...the expected Pumpkin Pie! Enjoy your Fall ideas menus and the meals you make and the company of those you share with!